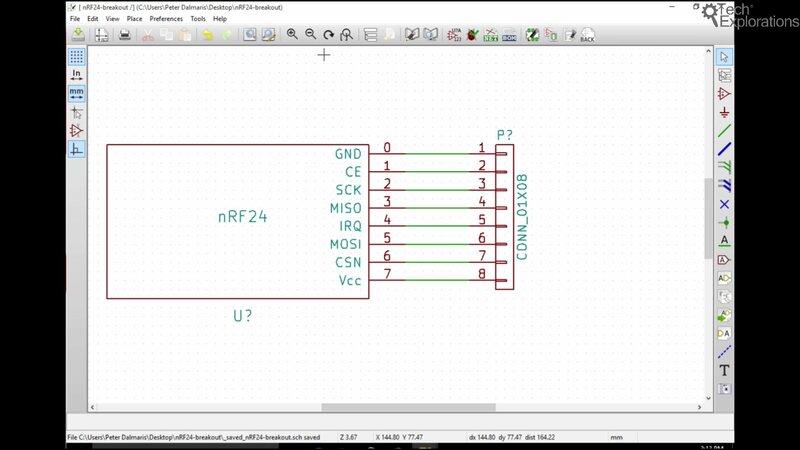 In this chapter we will connect the pins from the nRF24 component to the connector. There are two ways to do this. The first one is by using individual wires and just wiring each pin with its counterpart. The second method is to use labels. 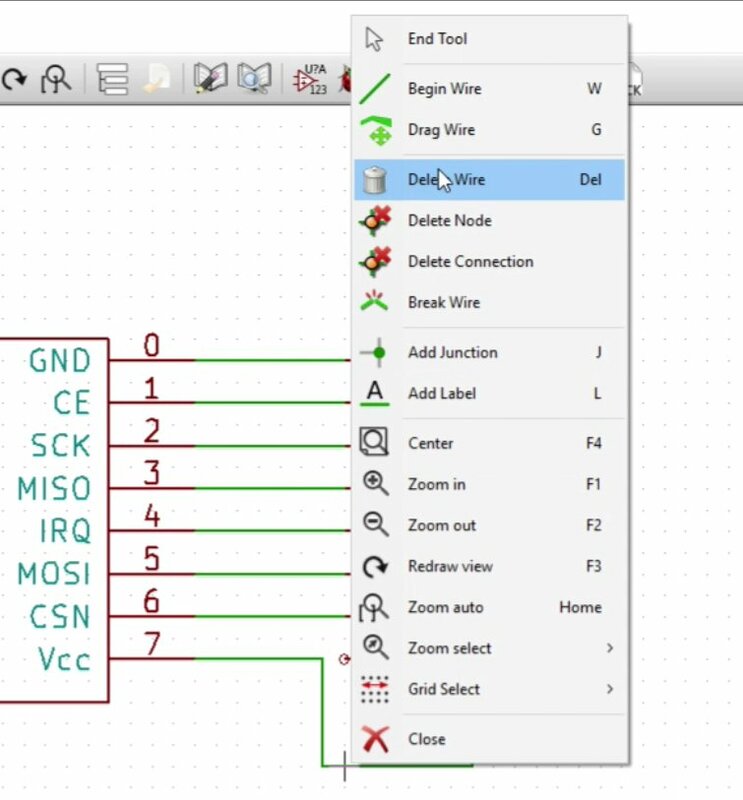 We can label each pin pair with a unique name, and Kicad will automatically connect those pins with the same name. In this chapter, we will use the first method. In the next project, we will use the second method. To create a wire you can use press the “W” key (“W” for “Wire”), or you can click on the wire button. I prefer to use the ‘W’ key instead of clicking on the wiring button. So, I hit the ‘W’ key, you can see that a wire now is being drawn. After typing “W”, click on a pin circle to start a wire, move the cursor to the pair pin’s circle terminal and click again to finish the wire. First you put your cursor over the pin, the circle of the pin that you’d like to start a connection from, then you hit the ‘W’ key, then a wire has already been drawn and is just following the cursor of your mouse. You just drag that along without having any buttons down, or any mouse buttons down, until you reach the pin where you’d like the wire to end. And you click again to finish the wiring. After making all the wirings, your schematic should look like this. Another thing to notice as this point is that once you hit the ‘W’ key once, you’ve already selected the wiring tool. From that point onwards, you don’t really need to continue hitting the ‘W’ key. It’s enough to just click and start the wiring, then click to finish the wiring. So, one click to start, one click to finish. If you make a mistake, it’s not a big deal. You can just delete or undo the error and try again. To delete anything on the canvas, right click on the object to reveal the context menu, and then choose the Delete option. Right click on an object to reveal the context menu. You can then choose to delete that object. 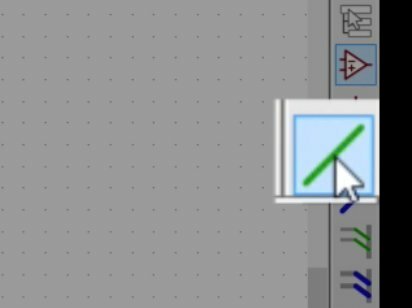 If you make an error but don’t realise it, you can get Kicad to find it. Let’s pretend that you have made an error in your wiring, and have left a pair of pins un-wired. 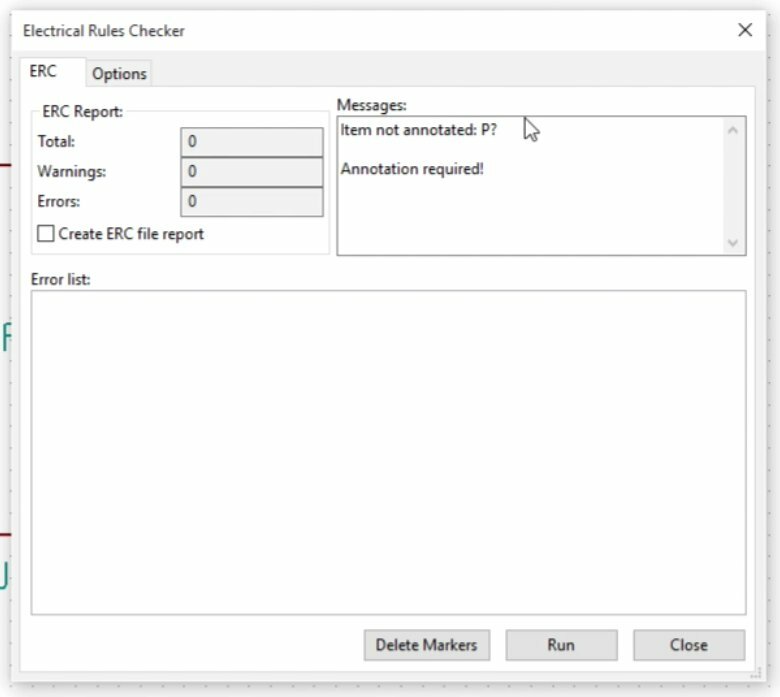 Kicad has a function called the “electrical rules check”, or ERC. To do an ERC, click on the bumblebee icon in the top bar. Click on the ERC button. The ERC dialog box will come up. Click on ‘run’ and do the test. The ERC has revealed that I forgot to do the annotations. The ERC, in this example, is telling us that we forgot to do the annotations. It’s ok, we will do this in the next chapter. Let’s save the project and the schematic at this point. Hit the ‘save schematic’ project. In the next chapter, we will annotate the schematic.